Penn State’s Andrew Cirino first shot was stopped by an impressive save by the UCLA keeper, but 5 minutes later he was able to put in a shot just under the crossbar to give the Nittany Lions the 1-0 lead. Italo Russo added a goal right before the half, knocking it into the corner of the goal with a nice touch off his right foot. Penn State’s defense held strong in the second to preserve the shutout and the win 2-0. Oregon’s Shinju Ogura put in a cross in the box from Henry Fassinger for the lone goal of the match as Oregon held off Purdue in its semifinal to advance to the championship match. The Ducks and the Nittany Lions will square off at 1:00 pm Central Time in the men’s open division championship. 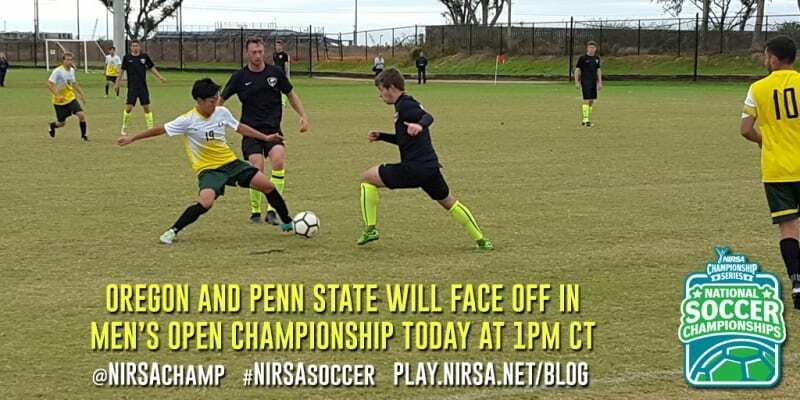 Watch for live updates on Twitter @NIRSAchamp and #NIRSAsoccer.